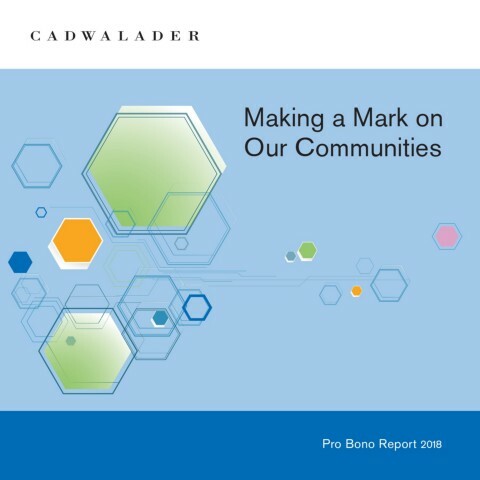 Cadwalader is committed to using the resources of the firm to make a difference in our communities and in the lives of people who could not otherwise afford legal representation. This commitment, in all of our locations, is evidenced by the wide variety of pro bono and community service projects undertaken by our attorneys. As one of the nation's oldest law firms, Cadwalader has a longstanding commitment to professional service in the public interest. From helping found the Friends of the Law Library of Congress in the early 1900s and publishing a practical guide for residents and community groups on using civil laws to combat illegal drug trade in the 1980s, to assisting individuals, families and businesses affected by the September 11 terrorist attacks and implementing a robust high school mentoring program, we are proud of our tradition of giving and dedicated to fulfilling our obligation to assist those with limited access to legal services. As always, we bring the same unwavering commitment and expertise to our pro bono matters as we do to all other legal work handled by the firm. We are honored to be able to help our clients, all of whom have enriched our understanding of the larger communities of which we are a part. Cadwalader will continue to strive to fulfill our obligation to indigent individuals and organizations seeking guidance in navigating our justice system. We look forward to further enhancing our public service efforts in the years to come and continuing to make a mark on the world around us.